CONSAL is a Unique, modern, clean Multi-page responsive multipurpose html5 WordPress Theme. Good for small website like agency, business, consulting etc. Please visit this link for importing demo easily. 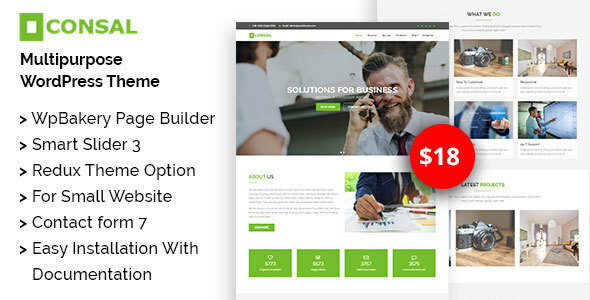 Features Drag and drop page builder (visual composer) W3c Valid Cross Browser Compatible Mobile Responsive Contact form 7 Smart Slider 3 easy installation Well Documented 24/7 Support Images are only for demo purpose and not included with the download bundle. Consal has been tested with browsers IE9, IE10, IE11, Firefox, Safari, Opera, Chrome, Edge.